Wyoming Basketball Running On Empty? 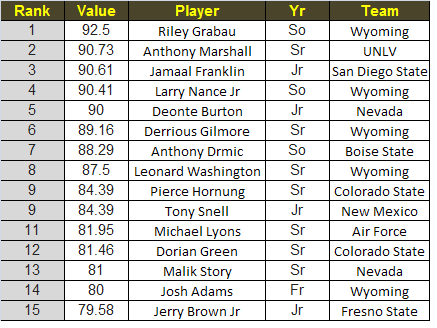 Wyoming has a staggering five players in the top 15 in terms of percent of minutes played in Mountain West conference games so far this season. Each Mountain West member school is represented on the list with only Nevada and Colorado State have more than one player with two players each. The added minutes Washington, Gilmore, Nance, Adams and Grabau are having to soak up are starting to have an impact on their defense and shooting. Shyatt may have to start giving more minutes to players such as Haldorson and McManamen even though he feels they are not ready for this level, in order to keep the starters a little fresher through the last half of conference play. This is not ideal of course and is by no means Shyatt’s fault as he is only in year two of a major rebuilding project. It is his solid coaching so far that has helped Wyoming get to where they are but the lack of depth is starting to wear on the team. With New Mexico tonight and Colorado State at the weekend Wyoming needs to figure out a balance in the rotation quickly to avoid starting a disastrous 2-6 in conference play.